We flew to Beijing this morning so I was up early at 5 a.m. The propeller plane was pretty smooth until it made a roller coaster type landing which gave me severe motion sickness. 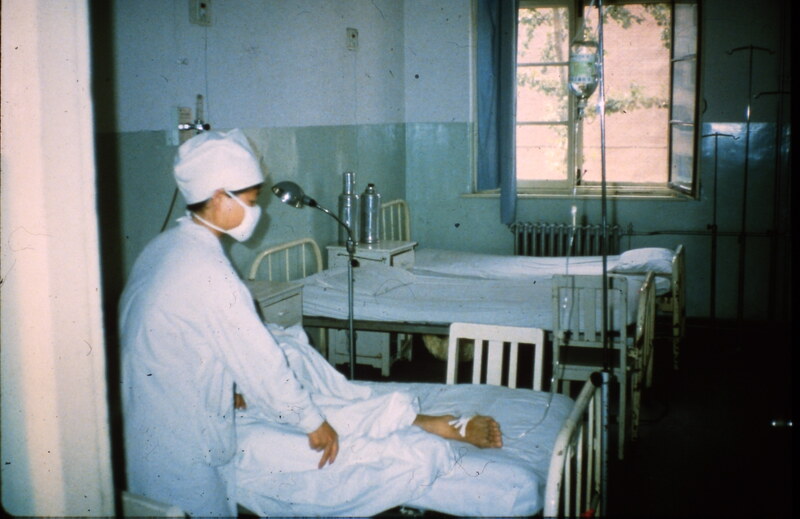 I was so tired after lunch that I skipped seeing the Forbidden City and Tiananmen Square, but I sent my camera along with one of the nurses. It was nice to be alone in this beautiful luxurious Holiday Inn where we are staying. Quite an upgrade from the cockroach infested hotel in Xian! After I slept, read my Bible, and wrote a letter, I ordered an American dinner from the menu of a hamburger, French Fries, milkshake, and wonton soup. I cringed at spending $8 (a hamburger costs me 62 cents in the USA), but this was the first American food I have tasted in a week since coming to China. It sure tasted good! I think I’ve eaten more rice this past week than I’ve eaten all year. I hope my stomach feels better by tomorrow when we climb the Great Wall. Mary is a delightful Christian nurse from Alaska on the tour and we have been enjoying sweet fellowship together. We are hoping to take a taxi tomorrow to visit a church. The Lord’s will be done. Yesterday was a full day! We climbed the Great Wall in 95-degree heat in the morning. It was quite a view from the top of the arid and rugged mountains. 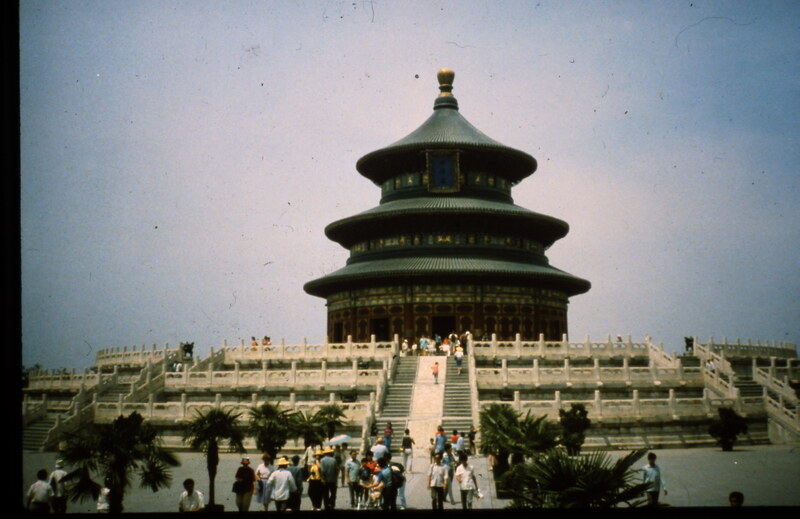 The emperor began building it in 300 BC to defend China from the Manchurians in the north. He made it wide enough so his whole army could march along the top of it. The wall stretches over 3000 miles from east to west in China. They estimate 400,000 slaves died while building it and were entombed in the wall. Climbing the steep Great Wall in 95-degree heat. I climbed a small ladder to sit on a camel and had my photo taken with the wall in the background. As I climbed down from him, he tried to bite me. 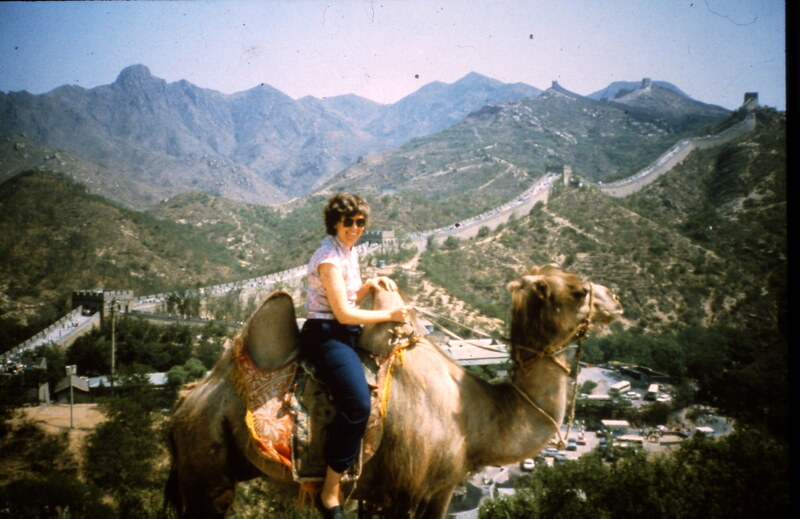 My favorite photo of China as I sat on the unfriendly camel. After lunch, we went to the Ming Tombs. My stomach still wasn’t too good, so I just sat in the garden and drank Coke. The others said they walked down five flights of stairs to a large underground empty cavern. Then we had a nice dinner at the Marco restaurant- western style! I felt much better after dinner. Mary and I checked on the Protestant church, but they only had morning services, so we had our own service together outside in the hotel courtyard garden. We read John 21 and comments from F.B. Meyer on the life of Peter. I can’t help but think of the verses in John 21 when Christ asked Peter three times, “Lovest thou me? Feed my sheep” (KJV). The three requirements for service are love, humility, and courage. May God give me all three. I have no idea what God wants me to do in relation to China. Mary and I then had a wonderful time in prayer together for the people of China to receive Christ as their Savior. It was so refreshing to both of us to worship the Lord together! 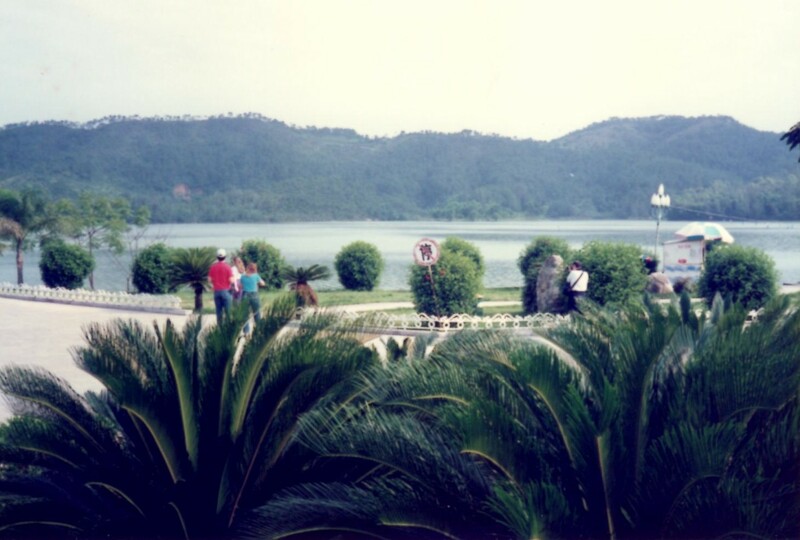 Today, we toured the beautiful Summer Palace built on the Hill of Longevity overlooking Kunming Lake. 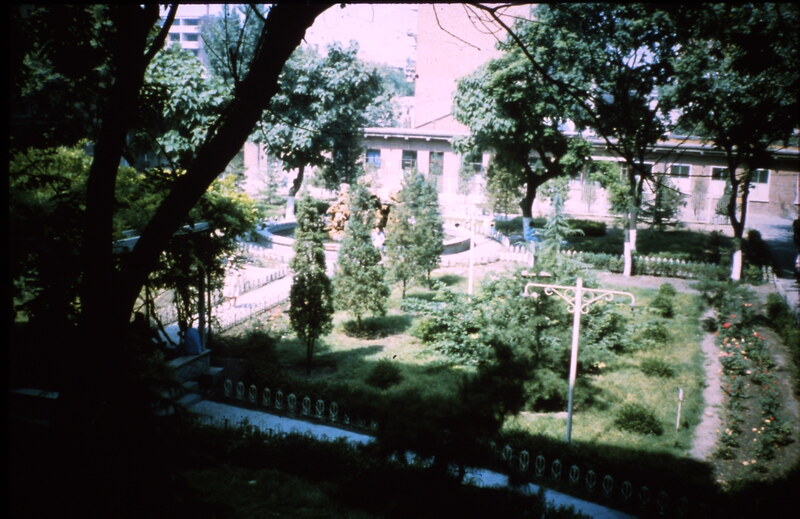 After being destroyed by fire, it was rebuilt in 1886 for Empress Cixi and became a public park in 1924. We enjoyed an excellent lunch including sweet red bean steamed rolls- just like the Korean ladies served me back home. 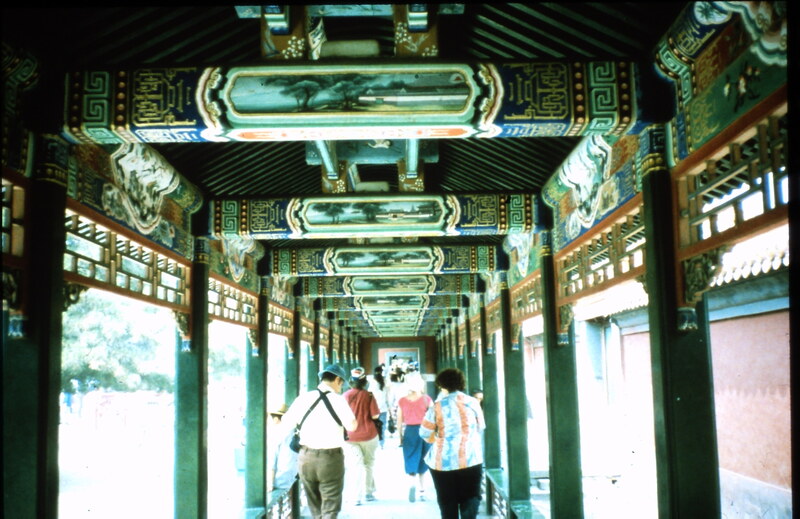 Intricate paintings in the Summer Palace. Some of the nurses had fun dressing up as the Empress. 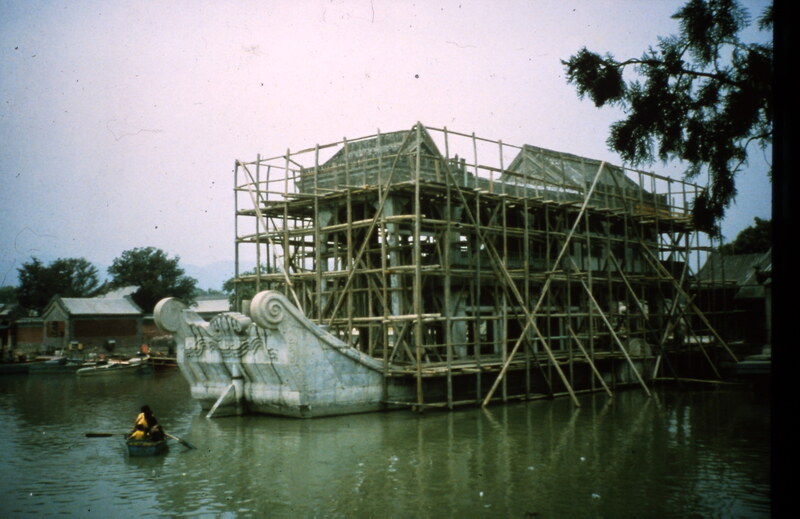 Empress Cixi’s marble boat that never floated was being repaired. The comical parent pandas at the zoo combed the fur of the baby panda as he played. Mother panda with her cute baby. 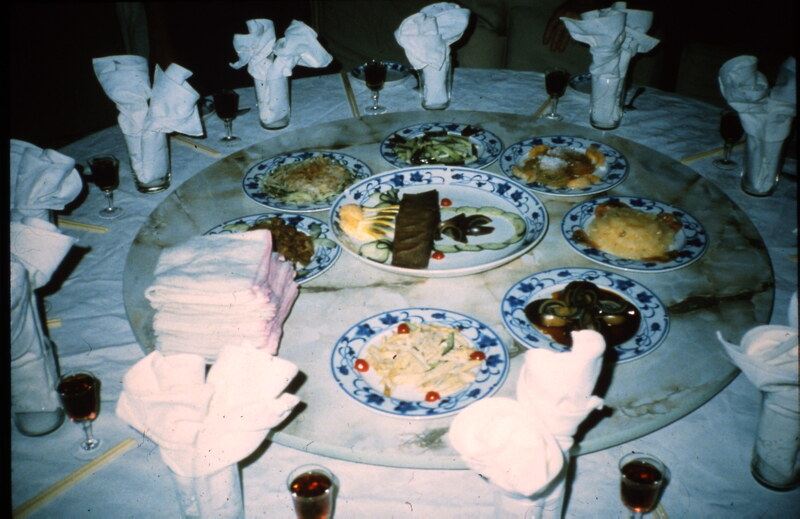 The memorable Peking duck dinner was my favorite meal. They roasted the honey-coated duck over a fruitwood fire for two days until all the fat drained off. Then they sliced the duck in small pieces which we put inside a crepe with scallions and plum sauce, and rolled it up like a hot dog. We visited a general hospital for adults this morning and had very friendly nurse tour guides. A neurology nurse gave me her address and asked me to write to her. I included a gospel of John and gospel tract inside my hospital’s magazine that I gave her as a small gift. 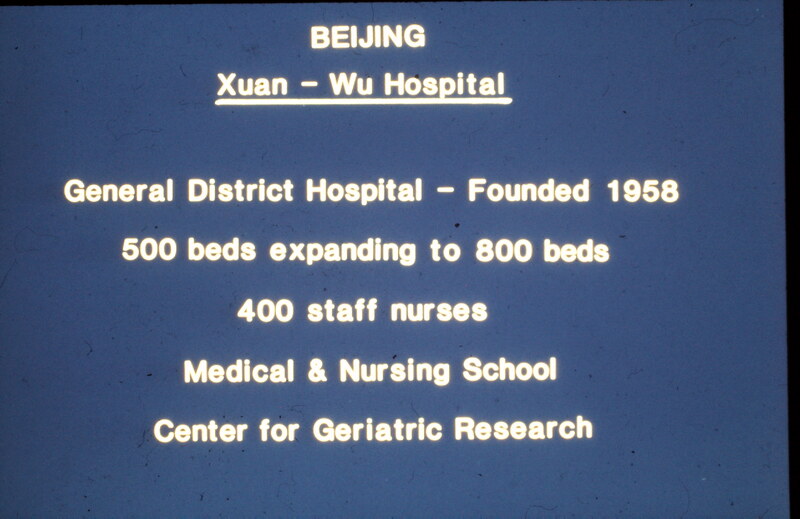 I was amazed that the Director of Nursing offered me a job to teach there! But the whole atmosphere is so dark and depressing. I don’t think I would survive there alone for very long. Friendly Neurology Nurse who was our guide. 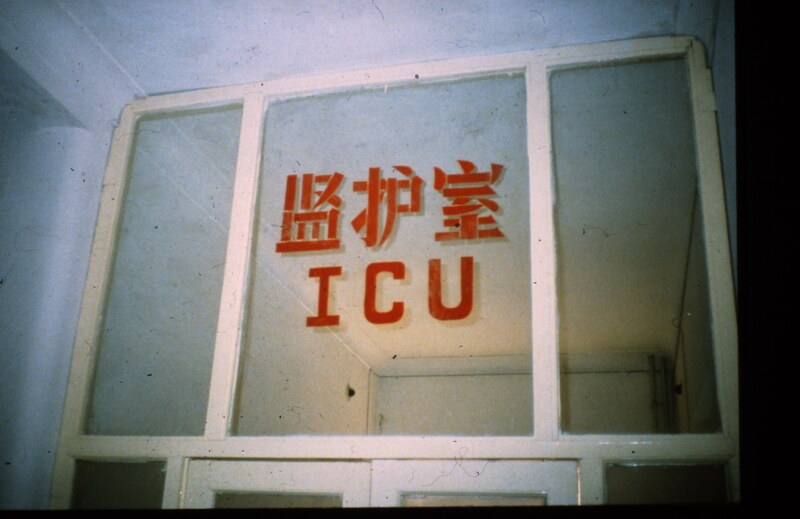 Entrance to Intensive Care Unit. 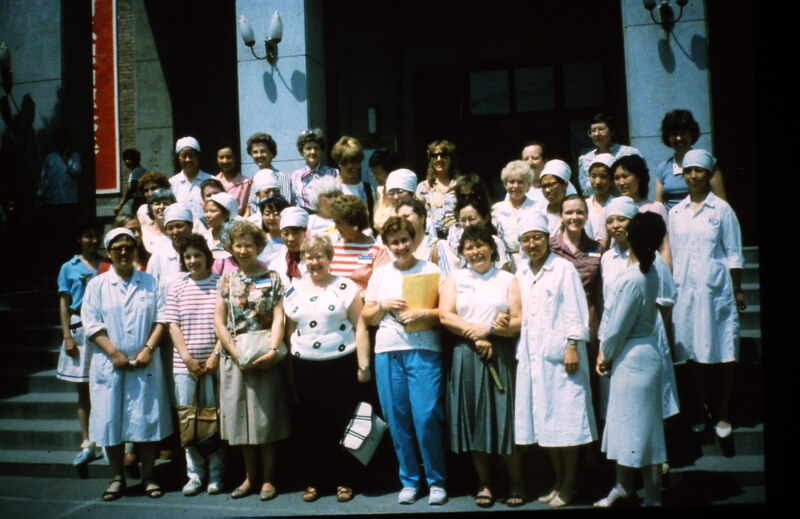 Tour Group photo with hospital nurses. The traditional pharmacy stocked dried lizards, snakes, and essence of frog and antlers among other things. 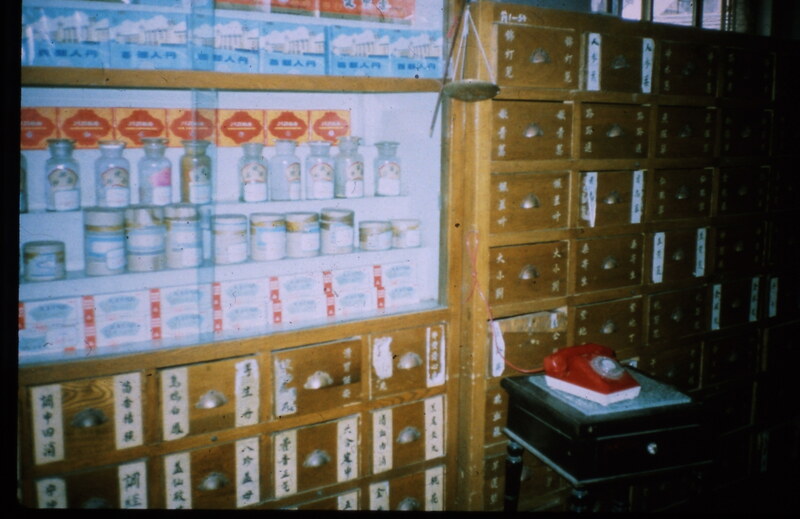 Traditional pharmacy with dried lizards, antlers, and herbs. I also walked the back streets alone for the first time. I was sad to see the poverty and smell the stench as the unfriendly people glared at me. I came across a market where they sold vegetables, live chickens, and roasted ducks. The average Chinese does not have a refrigerator, so they need to buy food daily. We then flew to Guangzhou (formerly called Canton) and arrived about 7 p.m. We stayed at a beautiful hotel in the country by a lake and had our farewell Cantonese dinner which was superb! We said goodbye to our Communist tour guide. He told us this hotel was formerly only used by Communist party leaders. I still have about 15 Chinese gospels of John which I don’t want to take back home. After asking the Lord what to do, I decided to leave them in my hotel room. I pray the housekeeper will deliver them to people who have hungry hearts to know the truth. I am thankful that God’s word never returns void. After breakfast, we boarded the express train to Hong Kong. 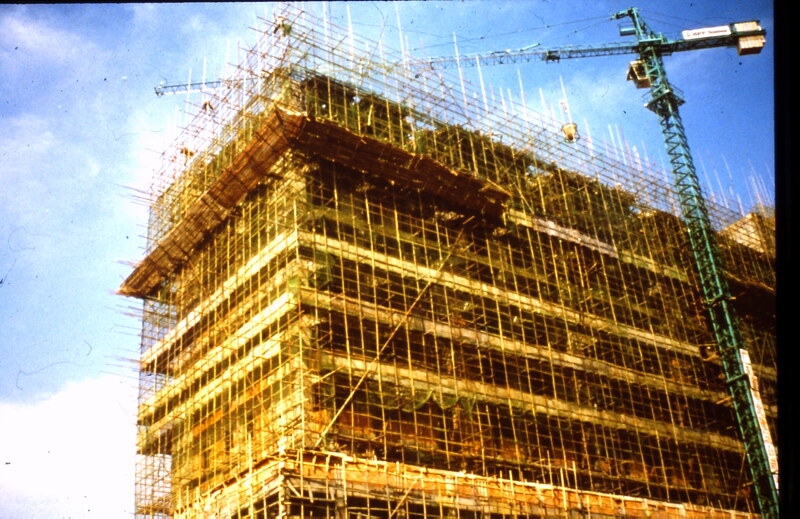 There is quite the building boom going on in Guangzhou with bamboo scaffolding everywhere. The scaffolds don’t look too sturdy to me. Bamboo scaffolding looked scary to me. 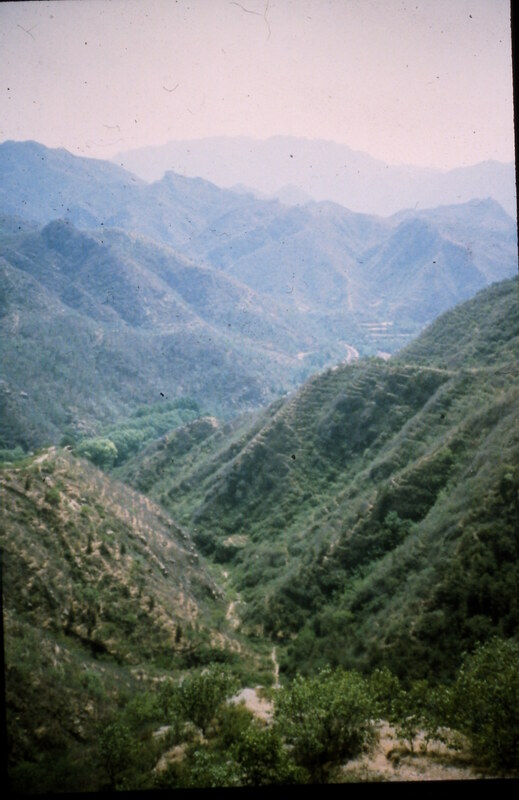 The southern China countryside we viewed from the train window was gorgeous. 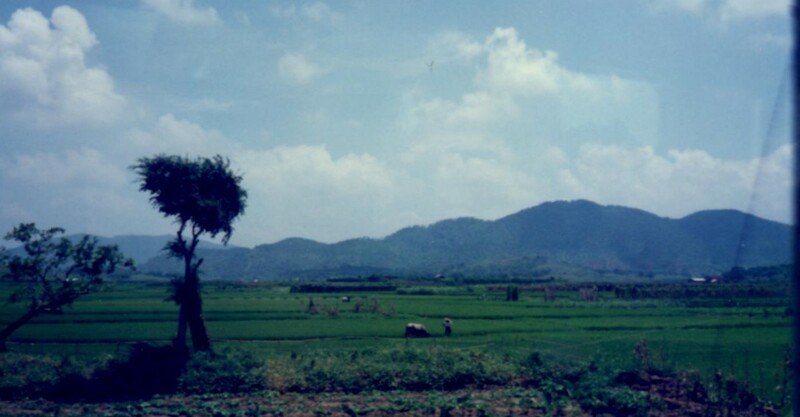 We rolled past brilliant green rice fields, water buffaloes, and fishing ponds. Farewell, China! Green rice fields on the way to Hong Kong on the train. 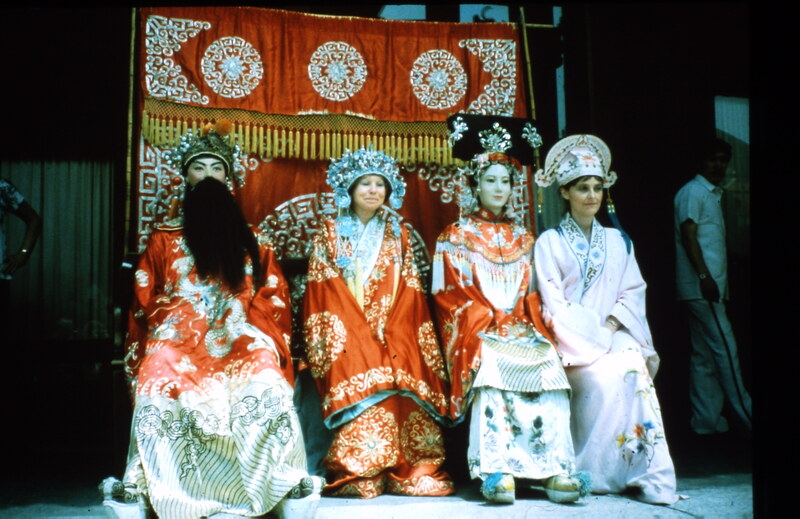 I thank God for allowing me to go to China after reading so many missionary books about it. 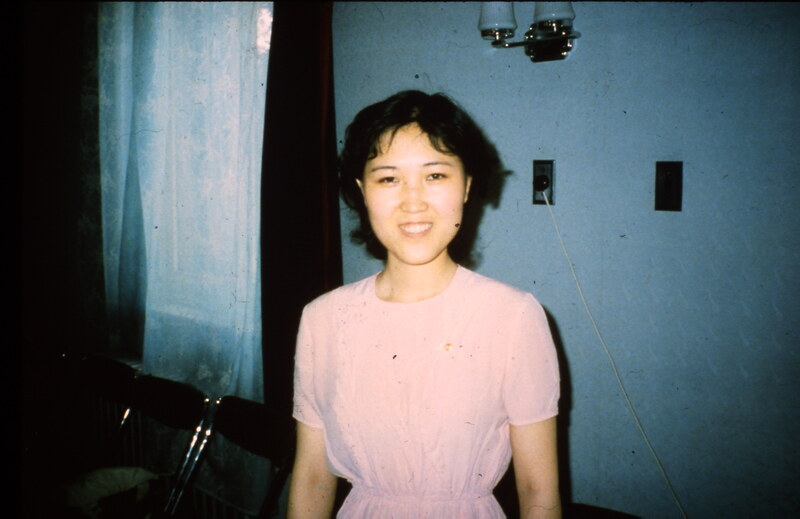 I didn’t have any further trouble with my eyes, and my mother did well with her cancer treatment while I was away. 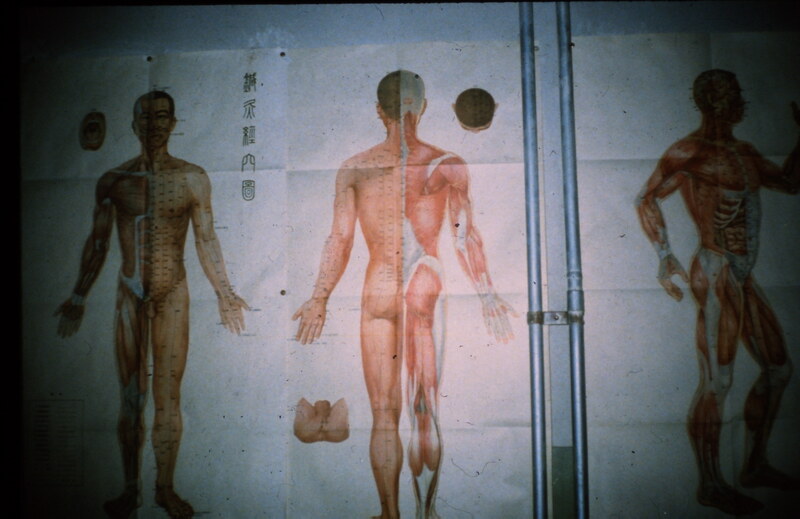 The Lord opened the door for me to return to Beijing in 2004 to assist in caring for some orphans. 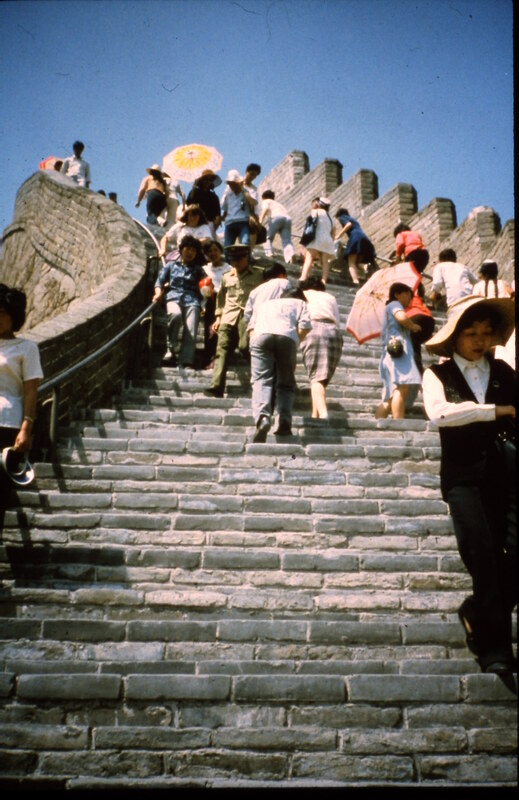 During a break, I was able to tour Tiananmen Square and the fascinating Forbidden City that I missed in 1986 because of my motion sickness. Next post I will tell you about the end of the tour in Hong Kong and my time in New York City on the return trip!